This book presents 1,001 melodic gems played over dozens of the most important chord progressions heard in jazz. This is the ideal book for beginners seeking a well-organized,easy-to-follow encyclopedia of jazz vocabulary,as well as professionals who want to take their knowledge of the jazz language to new heights. 101 Guitar Tips contains invaluable guidance on everything from scales and music theory to truss rod adjustments,proper recording studio set-ups,and much more. The book also features snippets of advice from some of the most celebrated guitarists and producers in the music business,including B.B. King,Steve Vai,Joe Satriani,Warren Haynes,Laurence Juber,Pete Anderson,Tom Dowd and others,culled from the author's hundreds of interviews. Now you can add authentic blues feel and flavor to your playing! Here are 101 definitive licks - plus a demonstration CD - from every major blues guitar style,neatly organized into easy-to-use categories. They're all here,including Delta blues,jump blues,country blues,Memphis blues,Texas blues,West Coast blues,Chicago blues,and British blues. Now you can add authentic jazz feel and flavor to your playing! Here are 101 definitive licks,plus a demonstration CD,from every major jazz guitar style,neatly organized into easy-to-use categories. They're all here: swing and pre-bop,bebop,post-bop modern jazz,hard bop and cool jazz,modal jazz,soul jazz and postmodern jazz. Includes an introduction by Wolf Marshall,tips for using the book and CD,and a listing of suggested recordings. Now you can add authentic rock licks to your vocabulary. Here are 101 definitive phrases,plus a demonstration CD,from every major rock guitar era,neatly organized into easy-to-use categories. They're all here! Includes licks from the Early Rock era,and the '60s through the '90s,plus a listing of suggested recordings. From tips on performing with a band to improving your tone to copping the essential techniques of the blues greats and beyond, this book is chock full of pointers to help everyone from the beginning student to the seasoned pro. Here, you'll learn how to: play with the band • become a strong rhythm player • use the full range of the guitar's natural tone • find the right kind of pickup • and much more. You'll also learn a multitude of techniques, licks and riffs. The CD includes demonstration tracks. From tips on arranging and speed-picking,to the maintenance of your guitar (and you!) and beyond,101 Tips and Tricks for Acoustic Guitar is chock full of unplugged pointers to help everyone from the beginning student to the seasoned pro. Here,you'll learn how to: evaluate a vintage guitar,repair a crack in an emergency,protect your guitar during air travel,make your own bottleneck,learn a flamenco strumming technique,master the convex barre,manage performance anxiety,discover new performance venues,and much more. The CD includes demonstration tracks. The term 12-bar blues has become synonymous with blues music and is the basis for an incredible body of jazz,rock 'n' roll,and other forms of popular music. This book/CD pack is solely devoted to providing guitarists with all the technical tools necessary for playing 12-bar blues with authority. The CD includes 24 full-band tracks. Covers: boogie,shuffle,swing,riff,and jazzy blues progressions; Chicago,minor,slow,bebop,and other blues styles; soloing,intros,turnarounds,accompanying keyboards and more. In standard notation and tablature. This cool book/CD pack presents a wide selection of riffs in a variety of styles, just waiting to be used in your solos! The riffs are organized by blues style and by placement within the standard 12-bar format (first, second and final four measures) so you can assemble your solos easily, section by section. This is the ultimate resource for beginning and intermediate blues guitarists seeking a straightforward route to solo-building, as well as for seasoned pros who want to further stock their arsensals. Includes a CD with recorded demos of every lick! For beginning guitarists,this book represents the sum of teaching works of Fernando Sor,the illustrious Spanish guitarist. Keep your music fresh with the great ideas in this new book! Covers: chords,dynamics,harmonics,phrasing,intros & endings and more! 39 outstanding classical guitar solos arranged with tablature for the first time. Includes: Bouree · Lagrima · Six Pavans · Canarios · Tarelton's Resurrection · Bach's B Minor Sarabande · and more. This convenient reference features easy-to-read diagrams of the most commonly used chords,including 30 chord qualities for each root note for a total of more than 350 chords. Includes an interesting introduction on the history of the 7-string guitar,a handy diagram of the complete 7-string fingerboard,basic chord theory,7-string guitar tab manuscript paper,and notes explaining how to use the book. Covers all styles of music. Now Available With CDs! This multi-volume method was developed to allow students to study the art of classical guitar within a new,more con-temporary framework. For private,class or self-instruction. Book One features an all-new format that incorporates chord frames and symbols,as well as a record to assist in tuning and to provide accompaniments for at-home practice. Book One also introduces beginning fingerboard technique and music theory. Book Two and Three build upon the techniques learned in Book One. A graded anthology of solo pieces (easy to intermediate) that serves as a supplement to Books Two and Three of A Modern Approach To Classical Guitar. Features compositions by: Sor · Giuliani · Carulli · Krieger · Caroso · DeVisee · Couperin · Telemann · others. A graded anthology of solo pieces (easy to intermediate) that serves as a supplement to Books Two and Three of A Modern Approach To Classical Guitar. Features compositions by: Milan · Sor · Carcassi · DeVisee · Mouret · Diabelli · Duncan · Bergen · J.S. Bach · Johnson · Dowland · Tarrega · Giuliani · Sanz · Gaspar · Romero · DeMurcia · Narvaez · Mudarra · Scarlatti · Hamler · Albeniz · others. Now available in a book/CD pack! The William Leavitt guitar method,used as the basic text for the Berklee College of Music guitar program,has stood the test of time and earned a vast and loyal following of guitar students and instructors. After mastering the basics from Volume 1,this intermediate-level book continues and builds upon the study of melody,scales,arpeggios and chords,covering the entire fingerboard. 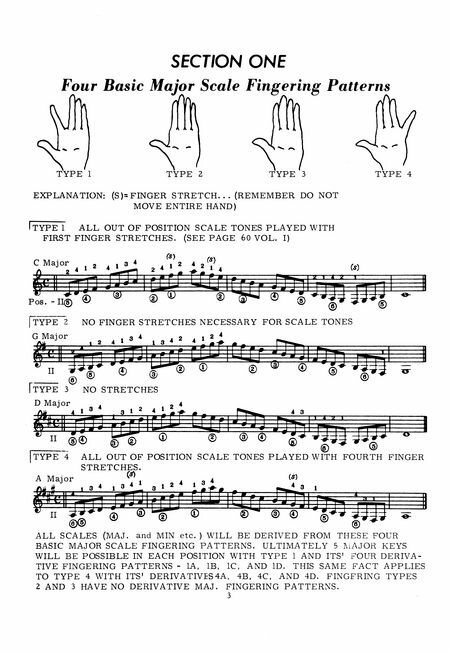 This volume also addresses: intervals,chord voicings,improvisation,rhythm-guitar techniques,play-along duets and more.